PYONGYANG, North Korea (AP) — Kumkhop Trading Co. President Ri Jong Ho sweeps his hand over a table full of foods produced at his factory. There's a bowl of assorted candies and rice cakes, a plate of sausages and ham, slices of a French baguette and Russian dark bread. "We are doing fine," he says with a confident smile. "Just look." But while model North Korean factories like Ri's, replete with a rooftop swimming pool ringed by banana trees, are filling the shelves of department stores in Pyongyang and elsewhere with ever better and fancier snack foods and sugary drinks, government officials and international aid organizations warn the nation could be on the verge of a major food shortage. North Korea's ambassador to the United Nations, Kim Song, issued an unusual appeal for "urgent" food assistance last month. North Korea blames the shortfall on a combination of bad weather and "barbaric" international sanctions. Critics argue the North is simply trying to use the situation to undermine support for sanctions without addressing the nuclear issues that led to them in the first place or the government's systemic economic problems. Potential donors, meanwhile, face the old but still controversial question: should the world help a government that seems determined not to help its own people? Kim, the ambassador to the U.N., said record-high temperatures, drought and flooding last year shaved more than 500,000 tons off of the 2018 harvest from the nearly 5 million tons produced in 2017. His statement was released just days ahead of Kim Jong Un's Feb. 27-28 summit with President Donald Trump in Hanoi. He said North Korean farmers have been hamstrung by "dreadful" restrictions on imports of everything from tractors, harvesters and sowing machines to chemical fertilizer, pesticides, herbicides and imports of refined petroleum. He also claimed that sanctions, or the fear of running afoul of them, are blocking or delaying legitimate assistance from possible donors and international organizations. Humanitarian assistance from the U.N. agencies is "terribly politicized," he said, and sanctions against North Korea are "barbaric and inhuman." North Korea claims it is now "channeling all its efforts" to importing food and increasing the output of early and basic crops such as wheat and barley in coming months. Even if Pyongyang achieves its targets of importing 200,000 tons of food and producing 400,000 tons of early crops, supplies will still fall short by 1.486 million tons. 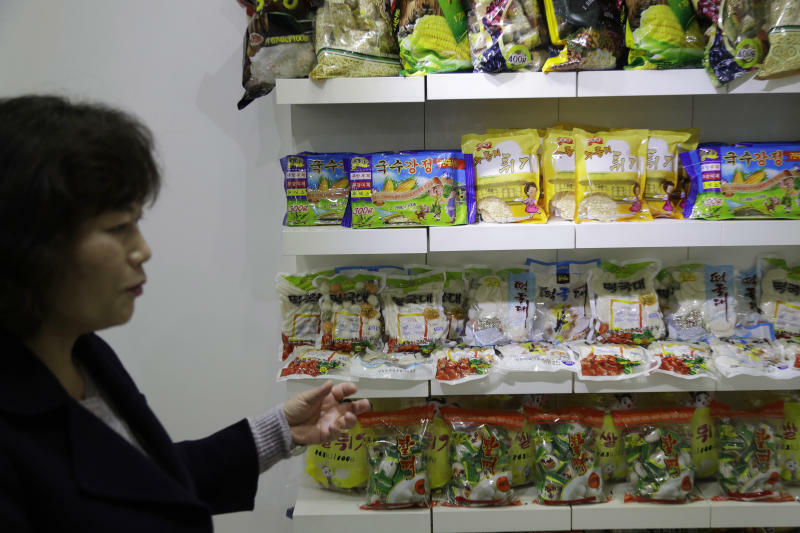 Hazel Smith, a North Korea expert at the University of London, believes food supplies in 2019 from all sources will only suffice to feed about three quarters of the population at the most basic survival level. But the shortage's severity likely won't be clear until July or August. "Without substantial external aid ... it is difficult to see any outcome other than large-scale deaths from malnutrition-related causes this year," she wrote in a commentary earlier this month for the Pacific Forum policy research institute. North Korea informed international organizations of the potential crisis in January. Praveen Agrawal, the U.N. World Food Program's representative in Pyongyang, said the WFP and the U.N.'s Food and Agriculture Organization are opening their own field assessment to determine if the North's figures are credible. Sanctions have had both "indirect" and "unintentional" effects on the situation, he said. Aid groups are hamstrung for a lack of support. The WFP, for example, has only gotten about $26 million for its operations in North Korea, less than half of its budget. Humanitarian aid is explicitly exempted from sanctions, but getting virtually anything through customs has become slower and more cumbersome. 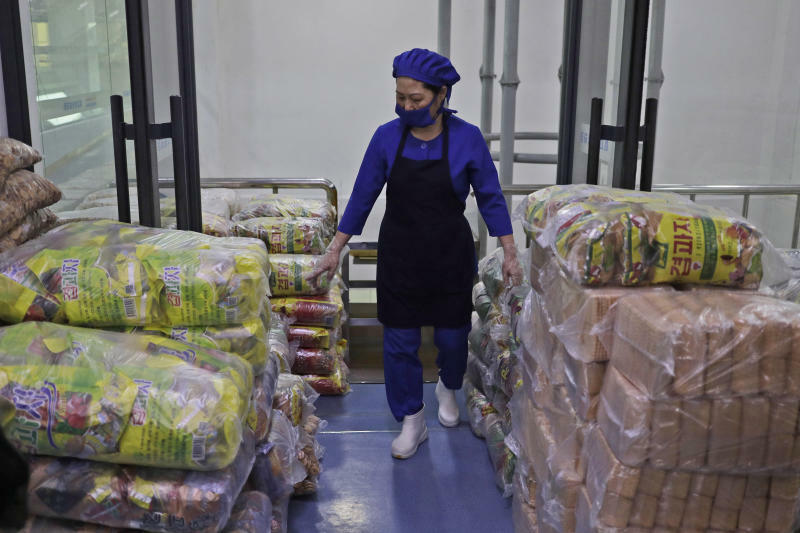 North Korea is chronically vulnerable to shortages. In its statement to the U.N., the government said it has cut its average food ration per capita for a family of blue- or white-collar workers to 300 grams from the target 550 grams per person per day. Agrawal said the government has never achieved that 550-gram target — reaching closer to just 380 to 400 grams. With a population of about 25 million and food production that even at its peak in 2016 was only about 5.8 million tons, it has never had enough to go around. "The situation can only get worse if they don't revisit and re-prioritize or help to address some of the issues through their ministries and technical areas," he said. Smith, the North Korea watcher at the University of London, said North Korea has made progress in improving food security since the famines of the 1990s, and now has malnutrition levels well below those of much richer Asian countries, including India. Agrawal said he has also seen more openness to engage and provide statistics over the past year as Kim has reached out to Beijing, Seoul and Washington. Smith believes the claim that the North doesn't deserve humanitarian help is fundamentally flawed. "In all cases where humanitarian aid — to stop people dying of starvation, disease and malnutrition-related illness — is given everywhere in the world, it is given to the population precisely because of the failure of their government," she said in an email to The AP. "No government 'deserves' humanitarian aid — but people do." All seem to agree the problem is real. "Forty percent of this population is malnourished — 11 million people," Agrawal said in an interview at his office in Pyongyang's diplomatic quarter. "That's a fact." Back in the food factory, company president Ri said that over the past three years his directions have been to produce more, and better, products. Kim has visited personally, twice, to drive that point home. "The leader cares a lot about the dietary food problems of the people," he said. The ramped-up output of factories like Ri's, which produces 40-50 tons of food each day, shows in supermarket and department store shelves stocked with a surprising variety of inexpensive, colorfully packaged and tasty — if not terribly healthy — chips, sodas and sweets. Opponents of sending aid to North Korea note the irony. 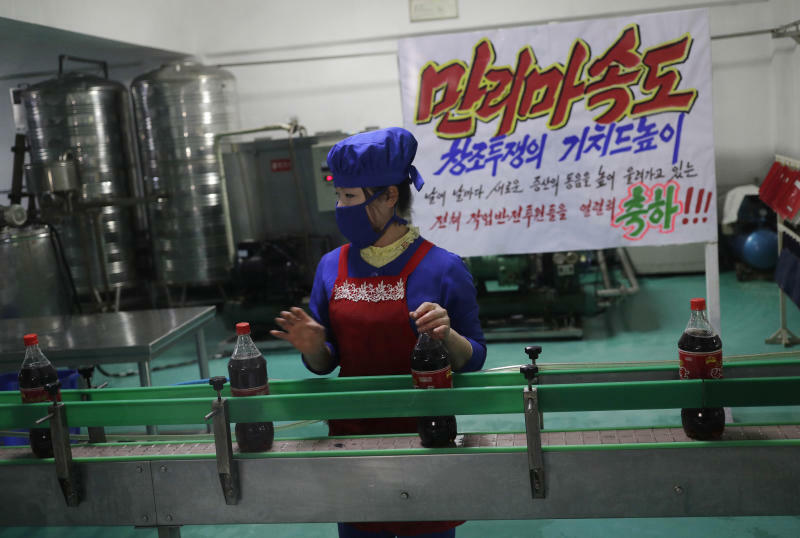 While the WFP is focusing on making nutritious biscuits for pregnant women and infants, Ri boasts his factory is now North Korea's most important maker of sports drinks. His group is doing so well that it's set up a processing plant across the border in Dandong to produce foods for the Chinese market. One of its most popular products is chocolate "moon" pies.